Richie Loidl shakes with Clemens Vogler, Christoph Steinbach, Daniel Ecklbauer, Robert Shumy, Albert Koch, Wolfgang Rainer & Dragan Trajkowski the peaks of Austria`s no1 skiing destination. again. Very honored to play in the context of "Tanzcafé Arlberg" which brings great international musicians to that great place. 31.03.2019 | 12:00 | sun | t.b.c. Skiin`, and shakin` with sun & fun! Richie Loidl and friends at Kitzbühel's Hot Spot! Enjoy best food & wine, high level service and hospitality. It is stylish, really cool and extremely "sunny" at Tomschy`s, situatet directly at mountain station of Hahnenkamm cable-car. Richie Loidl & friends right beside the slope. Have a great lunch and shake with us in that unique atmosphere. The Dampfkessel is rewarded as "Beste Schihütte" / "Best Après Ski Bar" in Austria! Richie Loidl Trio at that unique skiing-hotspot in the Salzburg Alps, which was built long before skiing 350 years ago and adapted in 1981. According to weather conditions we will either shake on sat 16th or sun 17th. Watch out 3 to 2 days before. Richie Loidl & friends right beside the slope shaking the skiing boots of trumer pils lovers - first time at Katschberg. "Hurra die Gams!!" Original Shake the Lake Session with Richie Loidl, Clemens Vogler & Marcus Brandl. Furthermore live on stage: Ethan Leinwand & Valerie Kirchhoff (USA), Martijn Schok & Greta Holtrop (NL), Ladyva (CH) and - for shure - the local heroes Martin & Sabine Pyrker. Please get your online tickets in time! A-6020 Innsbruck | Casino Innsbruck | T +43.512.587040-112, Email | 2-days-online-tickets & thu 27.4. | 2-days-online-tickets & fri 28.4. After one year off we are back at the Casino Innsbruck! I shake with Clemens Vogler, Christoph Steinbach, Anke Ankel - for the first time on 4 pianos, feat. Wolfi Rainer and Dragan Trajkowski on drums and bass! Richie Loidl Trio during the official opening celebration with invited guests, vips and partners. "Einfach leben - einfach genießen - einfach shaken!" Richie Loidl Trio shakin for boogie and swing dance lovers at the lobby-bar during that ball, organized by my friend dance school in my hometown. Please contact Tanz and More Dance School Bad Ischl, Anne or Werner for further infos and ticket reservation. Richie Loidl Trio at the famous skiing resort - very tasty 4 star superior hotel. You can`t get higher!! Richie Loidl Trio at the unique 5-star-superior "Larimar" Hotel, which is a real hotspot of well-being, recreation and taste! Albert Koch invites his boogie & blues friends for a breathtakin session. Richie Loidl Trio feat. Robert Kainar on drums, Gernot Haslauer on bass. Richie Loidl Trio at the unique 5-star-superior "Larimar" Hotel, which is a real hotspot of well-being, recreation and taste! Please click link toDance workshop-weekend dec 7th to 9th, which takes place in cooperation with TANZ & MORE DANCING SCHOOL from Bad Ischl. "Einfach leben - einfach genießen - einfach kochen!" Richie Loidl shakin` for invited cooking and enjoyment passionate key account partners of Trumer Privatbrauerei. Richie Loidl & Clemens Vogler on two pianos feat. drums & bass after kids concert show. Tickets 15,- VVK 17,- AK in der Bürgerservicestelle Gmunden und auf oeticket.com. Details siehe auch Kunstpreis-Flyer. Family David's "Haras de Sens" is a pittoresque stud in one of the most beautiful villages of France / Normandy / 10 km off the coast near Cabourg. Raising horses (trotters) is David's principal business but also organizing a boogie-festival since 1996 twice a year. Therefore a stable was changed into a concert hall. Perfect to spend an unforgettable weekend! Get tickets in time! Traditionally I do the afternoon-warmup of the highlight-event at my brothers k.u.k. Hofbeisl. On that day the whole city of Bad Ischl is closed for cars - guests walk on a red carpet. Best open air sound guaranteed! "Einfach leben - einfach genießen - einfach golfen!" Richie Loidl Trio shakin` for invited golfing key account partners of Trumer Privatbrauerei. After great success in 2017 we keep summer:shakin` 2018! Watch SUMMER:SHAKE-movie 2017 and see SUMMER:SHAKE-fotos 2017. Great 2018 line-up and program on Panzerhalle SUMMER:SHAKE website. Vernissage "Here comes the Sun" by Doris Marka. Shake the Lake stars C.Vogler, M.Brandl, J.Schuetten, R. Loidl feat. C.Steinbach, D.Ecklbauer, G.Haslauer, R.Kainar. Franz Trattner Firstline Summer:Shake project feat. Chanda Rule. 5th China Boogie Festival - Let`s "SHAKE THE (YANQI) LAKE!" After successful "Shake Shanghai" in 2012 and Beijing-shows in 2015, 16 and 17 we shake the chinese capital in one of the most incredible places you can imagine. The Sunrise Kempinski is more than a hotel - it is a destination! See the CCTV-Spot of the 2016 festival. Fri 25.5. "Piano Masters Session", sat 26.5. "Swing & Boogie Woogie Gala" with Dinner & Dance Extravaganza, sun 27.5. "Jazz & Boogie Brunch". Perfect to spent a shaky weekend right beside the Great Chinese Wall. .
Richie & friends playing VIP-night for all participants of the sailing week. Richie Loidl & friends shakin the peaks of Austria`s no1 skiing destination. again. Very honored to play in the context of "Tanzcafé Arlberg" which brings great international musicians to that great place. Richie Loidl and friends at Kitzbühel's Hot Spot! Enjoy best food & wine, high level service and hospitality. It is stylish, really cool and extremely "sunny" at Tomschy`s, situatet directly at mountain station of Hahnenkamm cable-car.&excl; See Tomschy`s Sunshine Shaking Flyer. New date 25.3. t.b.c. 2 days before, if weather is fine! Richie Loidl Trio at that unique skiing-hotspot in the Salzburg Alps. Special 3 course menu and wine tasting. Richie Loidl Trio at that unique skiing-hotspot in the Salzburg Alps, which was built long before skiing 350 years ago and adapted in 1981. "Einfach leben - einfach genießen - einfach shaken!" Jean-Pierre Bertrand`s great festival. Perfect to spend an unforgettable weekend with us. Music, winetastings, restaurants, châteaux and sightseeing in one of the world`s best wine-regions.Save the date, visit BBB festival-website, reserve your tickets in time at contact above! ...no better way to communicate "einfach leben" - the slogan of Austrias No 1 pils (=high quality lifestyle-beer). Richie & Clemens shake on two pianos at the Trumer Pils-stand for about 30 years...!!! 2017 edition with friends like the great Harry Ahamer and "Mr Amore Daniel Ecklbauer"
Richie Loidl solo at that incredible beautiful and tasty place. Perfect to spend a "golden october-weekend" in the picturesque mountains of Graubuenden, Switherland. 4th China Boogie Festival - Let`s "SHAKE THE (YANQI) LAKE!" After successful "Shake Shanghai" in 2012 and Beijing-shows in 2015 and 2016 we shake the chinese capital in one of the most incredible places you can imagine. The Sunrise Kempinski is not only a hotel - it is a destination! See the CCTV-Spot of the 2016 festival. Fri 8.9. " Piano Masters Session, sat 9.9. Swing & Boogie Woogie Festival-Show with Dinner & Dance Extravaganza, sun 10.9. Jazz & Boogie Brunch. Perfect to spent a shaky weekend right beside the Great Chinese Wall. Download Festival-pdf-Info, book via Kempinski website. Traditionally I do the afternoon-warmup of the highlight-event at my brothers k.u.k. Hofbeisl. On that day the whole city of Bad Ischl is closed for cars - guests walk on a red carpet. Best open air sound guaranteed! At 18:00 be happy to shake, rattle and roll with my friend Franz Trattner & his special 1st Line Project for k.u.k. Bad Ischl! Watch out the k.u.k. Hofbeisl eventpage for more info! Let`s shake the Côte Bleue! Carry-le-Rouet is a beautiful village between Marseille and Martiques and called "la Perle de la Côte Bleue". The blue sea & the blues, beach & boogie create a unique summer experience of "SWING & FUN WITH SEA & SUN"! Richie Loidl & Jean-Pierre Bertrand shake with Chris Conz, Julien Brunetaud, Albert Koch & band, unifying their spirits of "Shake the Lake" & "Beaune Blues Boogie". See also CARRY BOOGIE NIGHTS FACEBOOK PAGE! This is not only a lake. It is the Lake Weissensee with its unique, charismatic atmosphere. There is something in the air. You can feel it. Hotel Weissenseerhof with excellent cuisine, beach, spa & staff! Take the chance an spend a good time with us! Richie Loidl Trio feat. Franz Trattner on drums & Peter Strutzenberger on bass. Details coming. Let`s go on with the great party after first session in 2016. Will be great for dancers / dance & vintage-clubs - please save the date and come over. Franz Trattner on drums, James Hornsby on bass. Richie Loidl Trio, Schmankerltreff with European grilling champion Franz Kupezius, charity for needy children. All details and info for tickets see at Charity Classico Enns flyer. Axel Zwingenberger, Martin Pyrker, "Lakeshakers" Marcus Brandl, Clemens Vogler, Johnny Schütten, Richie Loidl & band feat. "PANZERHALLE SUMMER:SHAKE After Show Session" live on stage. Get your online ticket in time. All details at the STREET:BEER-Website. It should have been the opening event of Shake the Lake 2017. Now it is (almost) all in one! R. Loidl, M. Brandl, C. Vogler, J. Schütten, C. Steinbach & his Boogie Boosters, F. Trattner`s 1st Line Soul Project, N. Rochelle, H. Ahamer, D. Ecklbauer, F. Gschaider & more. Tickets 50,- including 25,- for food, drinks & more (52,50 online via Ö-Ticket, 55,- Abendkasse). All details at the SUMMER:SHAKE-Website. Richie Loidl & Jean-Pierre Bertrand with a concert for mutual understanding and friendship on a Boesendorfer Imperial grand piano at the representative and beautiful venue of the Austrian Embassy in Paris. Details & news coming soon at the AAP website. If you are interested send an email to Richie Loidl. Richie & friends playing VIP-night with all participants of the sailing week. Boogie, Swing and Glamour of the 1920ies in the context of "Klassikwelt Bodensee"
Richie Loidl with the incredible "Sazerac Swingers" feat. Marlene von Steenvag, "Germany`s Queen of Burlesque". Happy to meet all our "Shake the Ship" fans and dancers of last 6 years there (the festival takes a break in 2017). Details at Klassikwelt Belle Epoque Website. Richie Loidl with Chris Conz trio on two pianos. Chris is the 2013 Swiss Jazz Award-winner and one of the smartest boogie-pianists I know. Together with his trio his performance is unique and charactarized by a very special swing & charme. Happy to meet all our "Shake the Ship" fans and dancers of last 6 years there (the festival takes a break in 2017). 25 Years Casino Innsbruck anniversary edition! The great club-concert to be continued! Richie Loidl & friends feat. Anke Angel`s "Wonder Woman Show" on thu 27.4. and feat. Christoph Steinbach`s Hottest Boogie Session on fri 28.4. Don't miss that great show and get your tickets in time! Richie Loidl & Clemens Vogler on two pianos, feat. Franz Trattner & Gernot Haslauer on drums & bass. Very honored to play in the context of "Tanzcafé Arlberg" which brings great international musicians to Austria`s no1 skiing destination. Let's have some REEEAAAL FUN in Austria`s home of skiing world champion Hermann Maier. Arrive on friday evening or ski all day, enjoy relaxing wellness and dinner in one of Flachau`s great hotels, ski all saturday, party with us at the Paularei on saturday night, ski on sunday morning and boogie-brunch with us at the legendary Dampfkessel at noon 12 a.m. right next to the slope with your skiboots on! Book your hotels via Flachau Tourist Office. Please share "shake the snow space facebook-page"! Richie Loidl Trio at that unique skiing-hotspot in the Salzburg Alps. Special 3 course menu and wine tasting by Weingut Esterhazy. Richie Loidl Trio at Kitzbühel's Hot Spot! As a student in the late 80ies I spent some of the best time of my life in Kitzbühel, working as a barman at the legendary Drop-In disco (now "Take Five"). Now back with drums & bass at no1 and sunniest place in town with finest food, wine and service! Neujahrskonzert - Shake the Skis! The ambience at this location and the rundown of this event will be unique and very special! Richie Loidl on grand piano, Robert Kainar on drums, Rocky Knauer on bass. Please reserve in time! Albert Koch invites his boogie & blues friends for a breathtakin session. Details coming! Richie Loidl, Clemens Vogler feat. drums & bass live at the ZellamseeXpress upper station (1.920 m), which is part of the famous Schmittenhoehe skiing resort in Zell am See. "Gondelroulette"and live music starts at 9 a.m., ends 12:30 a.m.! Special music show and moderation by the charming Missy May from Vienna. Save the date - details coming! ...no better way to communicate "einfach leben" - the slogan of Austrias No 1 pils (=high quality lifestyle-beer). Richie & Clemens shake on two pianos at the Trumer Pils-stand for about 30 years...!!! One of the best festivals in France since 1996! Anniversary edition! Family David's "Haras de Sens" is a pittoresque stud in one of the most beautiful villages of France / Normandy / 10 km off the coast near Cabourg. Raising horses (trotters) is David's principal business but also organizing a boogie-festival since 1996 twice a year. Therefore a stable was changed into a concert hall. Perfect to spend an unforgettable weekend! Get tickets in time for that great anniversary! After successful "Shake Shanghai" in 2012 and cancelled Beijing-show in 2015 we definitively shake the chinese capital in one of the most incredible places you can imagine. The Sunrise Kempinski is not only a hotel - it is a destination! Richie Loidl, Johnny Schuetten, Christoph Steinbach & Martin Schmitt on two Feurich grand pianos feat. Nicolle Rochelle - vocals, Franz Trattner - drums and Peter Strutehberger - bass. Shakin` for my friend Harald together with Guenther Brackmann, Eight to the Bar, Boogie Connection, Lukas Sprenger and Hootin the Blues. 11.08.2016 | 19:00 | thu | open air festival: ONLY IF WEATHER IS FINE! 6th Brixen Boogie Festival: "Dine, Wine & Music"
In 2016 we keep shakin in Brixen, which is a very charming city in Südtirol. Local top restaurants serve culinary highlights. Richie & Anke Angel on two pianos, Eddy Miller with his trio and Franz Trattner & James Hornsby on drums & bass shakin at the historic Domplatz. Free entrance! See Shake the Dome Movie and pics to get an impression of the unique Event! Richie is powered and dressed by Luis Trenker, Bolzano. After big success in 2014 and 2015 to be continued: Let`s shake the Côte Bleue! Carry-le-Rouet is a beautiful village between Marseille and Martiques and called "la Perle de la Côte Bleue". It was obvious to unify the blue sea & the blues, the beach & the boogie to create a unique summer experience of "SWING & FUN WITH SEA & SUN"! Richie & Jean-Pierre Bertrand shake with Clemens Vogler, Daniel Ecklbauer, Nicolas Peslier, Christian Vaudecranne, Zef Richard, Olivier Lalauze. See also CARRY BOOGIE NIGHTS FACEBOOK PAGE! This is not only a lake. It is the Lake Weissensee with its unique, charismatic atmosphere. There is something in the air. You can feel it. And there is Richie Loidl on piano and vocals, Robert Kainar on drums and Peter Strutzenberger on bass! Traditional performance of Richie & Clemens Vogler on two pianos at one of the most beautiful places of Vienna. Our challenge is to create an easy listening swing & boogie groove in the background of the business talks. Fri 3.6.: Shake the Lake Session with Clemens, Markus, Johnny, Richie & friends. Sat 4.6.: Eddy Miller: Swing to the Beat. See all details at k.u.k. Book 2016! First time we do that highlight-festival end of may with high chance for perfect weather! Richie shakin with Clemens Vogler, Johnny Schuetten, Daniel Ecklbauer, Karl-Friedrich von Hohenzollern, Pierre-Alexandre Petiot. Top-act: Christoph Steinbach and his boogie boosters! Christoph Buhse on drums, Gernot Haslauer and Peter Strutzenberger on bass. It is the 12 meter carbon catamaran racing class! Richie & friends playing at the VIP-ship between the races. Limited places for visitors. Please contact PROFS Sailing for prices, info and reservation. See GC32 video channel. A unique experience! The great club-concert to be continued! Richie Loidl, Chris Conz and Christoph Steinbach & his Boogie Boosters. Don't miss that great show and get your tickets in time! public | HIGHLIGHT SESSION in cooperation with "Shake the Ship / Bodensee" 28.-29.5. Richie Loidl & Clemens Vogler on two pianos, feat. Franz Trattner & Gernot Haslauer on drums & bass. Special guest: Karl-Friedrich von Hohenzollern on sax/voc/guit. Very honored to play in the context of "Tanzcafé Arlberg" which brings great international musicians to Austria`s no1 skiing destination. Watch out for Scott Bradlee & Postmodern Jukebox on april, 5th and Martin Schmitt on april, 6th! As a student in the late 80ies I spent some of the best time of my life in Kitzbühel, working as a barman at the legendary Drop-In disco (now "Take Five"). Now back with drums & bass at no1 and sunniest place in town with finest food, wine and service! ATTENTION: HAPPENS ONLY IF WEATHER IS FINE! OTHERWISE NEXT OR OTHER DAY. Let u know here and at my facebook-page! See also Tirol-forecast. Richie Loidl & friends. See congress-info on OEHV-Website. Albert Koch inviting his boogie & blues friends Christoph Steinbach - A, Balazs Daniel - H, Lluis Colloma - E, Harald Krüger - D, Christoph Buhse - D, Wolfgang Janischowski - D and for shure myself for a breathtakin session. See Kammgarn-Festival-Website for details! Christmas is over - New year is close. To enjoy these days in a place like the Posthotel is a privillege. If you don't know this giant "tyrolean temple of wellness" take the chance an pass by at the bar after dinner and shake with Richie Loidl Trio. Free entrance, reservation obligatory! Jean-Pierre Bertrand`s great festival. Perfect to spend an unforgettable weekend with us. Music, winetastings, restaurants, châteaux and sightseeing in one of the world`s best wine-regions.Save the date, visit BBB festival-website, reserve your tickets in time at contact above, details coming! Richie Loidl on stage with Kenny "Bluesboss" Wayne, Joerg Hegemann, Jean-Pierre Bertrand and Chris Conz. Visit Uster festival-website and reserve your tickets in time! BOOGIE BRUNCH: "SHAKE THE SCHLOSS"
Richie Loidl Trio - Franz Trattner on drums, Gernot Haslauer on bass. Please reserve your table in time! Very cool packages with brunch or with room! ...no better way to communicate "einfach leben" - the slogan of Austrias No 1 pils (=high quality lifestyle-beer). Richie & Clemens shake on two pianos at the Trumer Pils-stand for almost 30 years...!!! After successful "Shake Shanghai" in 2012 we shake the chinese capital in one of the most incredible places you can imagine. The Sunrise Kempinski is not only a hotel - it is a destination! Richie Loidl & Clemens Vogler on two Feurich grand pianos feat. Franz Trattner on drums and Gernot Haslauer on bass before and after the grand ballroom concert of Hamburg piano superstar Joja Wendt! 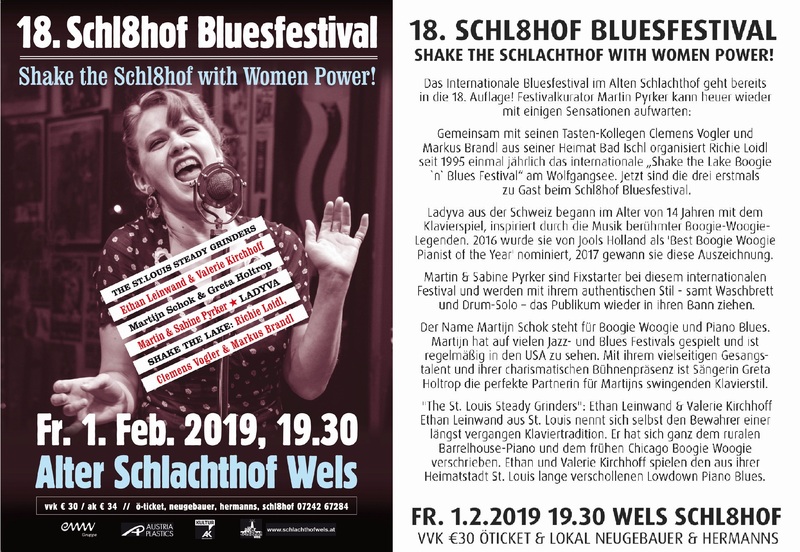 "SHAKE SHOWS ALL AROUND THE WORLD"
After such a great time in 2014 I am back, performing "traditional american boogie music from the shaky heart of Austria". Now with my boogie-buddy Clemens Vogler. After 30 years of shakin` we are on a special mission around the globe - representing our Shake the Lake festival-spirit and our beautiful home, the Salzkammergut holiday region - certainly the most beautiful spot to be at home! Richie Loidl Trio feat. Franz Trattner on drums & James Hornsby on bass. I is the last day of the Upper Austria Garden Show which lasted from april, 24th to oct 4th. For shure: The best act comes always in the end - haha! Come and shake with us! 20.-22.08.2015 | evenings & brunch | thu-sat | open air festival: ONLY IF WEATHER IS FINE! Because of anniversary for the first time 3 days! Brixen is a very charming city in northern Italy, south of Innsbruck. Local top restaurants serve culinary highlights. Richie & friends shaking open air at the historic Domplatz, on Plose - Rossalm 2.200m for sundowner and at wine gallery for brunch. All events free entrance! See Shake the Dome Movie, Shake the Dome pics 2014 to get an impression of the unique Event! Richie is powered and dressed by Luis Trenker, Bolzano. The Salzkammergut Summer Sessions: "k.u.k. Boogie Woogie Afternoon"
Traditionally I do the afternoon-warmup of the highlight-event at my brothers k.u.k. Hofbeisl. On that day the whole city of Bad Ischl is closed for cars - guests walk on a red carpet. Best open air sound guaranteed! At 18:00 be happy to shake, rattle and roll with my friend Eddy Miller & Group from Munich! Watch out the k.u.k. Hofbeisl eventpage for more info! It is a great place in a court of a "cloitre". Richie Loidl & friends, Thibaut Chopin on bass, Stephane Roger on drums & two grand pianos. See fotos of past festival. Vive la France! RICHIE WILL BE REPLACED BY THE GREAT DANIEL ECKLBAUER from Linz! The authentic ship-session with excessive boogie dancing atmosphere! After big success in 2014: Let`s shake the Côte Bleue again! Carry-le-Rouet is a beautiful village between Marseille and Martiques and called "la Perle de la Côte Bleue". It was obvious to unify the blue sea & the blues, the beach & the boogie to create a unique summer experience of "SWING & FUN WITH SEA & SUN"! To stay up to date see also the CARRY BOOGIE NIGHTS FACEBOOK PAGE! "The Salzkammergut Summer Sessions 2015"
Enjoy the most beautiful time of the year: Let`s shake the Wolfgangsee! Best cuisine and legendary bar as "Monte Carlo Platzl"! If weather is bad, we change date or shake inside at the Tex Mex in the Dorfstadl - keep visiting this website! This is not only a lake. It is the Lake Weissensee with its unique, charismatic atmosphere. There is something in the air. You can feel it. If you love classic cars before the war, classic planes and rallye nostalgy you also love boogie woogie, indeed! Richie shakin at the final gala evening ... Please register at Classic Events website! "A Tribute to the Lakes"
Life is shaking - and water is the origin of life. The lake Wolfgangsee is known as the "source of happiness"from which life-energy comes. Since 1995 it is the home of the Shake the Lake-spirit. "The Lake" is therefore the motto of the next festival and the focus is on special "lakeside sessions". It is the most beautiful time of the year: White tops of mountains, light-green grasses and flowers. We are in the high alps of the Salzburger Land. The Winterstellgut chef & crew welcome you with a delicious brunch and heartly, high level service! Richie Loidl Trio and friends. Please reserve as limited number of chairs & tables. It is only one week to go to our big 17th International Shake the Lake Boogie Festival at lakes Wolfgangsee, Hallstaettersee & Bad Ischl from june 4th to 7th. Therefore we will have a "warm-up" with Richie, Clemens, Markus, Christoph Steinbach & band at the "Salzburger Dult", the biggest public festival in western Austria with more than 130.000 expected visitors. Entrance is free, Reservation of tables via contact above! It is the incredible and unique festival on the coolest event-ship on one of the biggest continental lakes of Europe! Shake the Ship Session on MS Sonnenkoenigin on saturday night. Beachbar Bregenz Boogie Barbecue at on sunday morning. Richie shakes with Christoph Steinbach & the Kittens, Anke Angel, Johnny Schütten, Albert Koch, Harry Ahamer, Daniel Ecklbauer. 05.04.2015 | 12:00 | sun - t.b.c.! Richie Loidl & friends right beside the slope. Have a great lunch and shake with us in that unique atmosphere. The Dampfkessel is rewarded as "Beste Schihütte" / "Best Après Ski Bar" in Austria! DATE TO BE CONFIRMED - depends on snow and skiing conditions. Richie Loidl Trio feat. Robert Kainar on drums, Gernot Haslauer on bass. This is one of the first events of the summer-event-series, which I organize since many years together with my brother & team, who is the owner of the k.u.k. Hofwirt and k.u.k. Hofbeisl. Clemens Vogler, Markus Brandl, Richie Loidl & Johnny Schuetten present the final artist line-up and definitive program of the 17th Shake the Lake festival (thu 4. - sun 7.6. - see Shake the Lake - website). Robert Kainar on drums, Gernot Haslauer on bass. Drinks & snacks by Joe Ahrer's Stehbeisl. 5,- charity ticket supports Lebenshilfe Bad Ischl. Please buy ticket at contact above or at our Online Ticketshop. Richie Loidl Trio. Tickets: 12,- at the box office, 9,- advance sale, 7,- youth. Anniversary edition of the greatest swing & boogie dance festival in the world! It is all in the name of the Lord! Richie Loidl solo on piano - maybe getting support of lakeshaker Markus Brandl. We are on a mission ...! The great two-nights-club-concert to be continued! Richie Loidl, Christoph Steinbach and Johnny Schuetten on both evenings, Anke Angel on thu 22.1., the Kittens on Fr 23.1. Don't miss that great show and get your tickets in time! Richie Loidl & Christoph Steinbach`s tribute to our "Austrian Showtime Boogie Woogie Project 2002"
Richie Loidl on piano & vocals, Robert Kainar on drums & Gernot Haslauer on bass right beside the slope. Have a great lunch and shake with us in that unique atmosphere. The Dampfkessel is rewarded as "Beste Schihütte" / "Best Après Ski Bar" in Austria! NEW YEARS EVE AT "DER SCHWARZACHER"
Richie Loidl Trio at one of the best skiing and alpine lifestyle spots of the alps. For details see Der Schwarzacher website. Albert Koch inviting his boogie & blues friends for a breathtakin two nights-session. Let`s check out for most incredible festival end sept or beginning oct 2015! See movie "Shake Shanghai 2012"
Richie & Clemens on two grand pianos shakin with Boogie House, Blues Culture, Joerg Hegemann & Christoph Steinbach and others! See poster 2014 for details. ...no better way to communicate "einfach leben" - the slogan of Austrias No 1 pils (=high quality lifestyle-beer). Richie & Clemens shake on two pianos at the Trumer Pils-stand for almost 30 years...!!! This year Clemens cannot come - Lakeshakers Anke Angel and Robert Shumy will shake instead of him. Richie Loidl Trio and friends. Reservation obligatory. See the Lebenslust-Flyer for details! Fahr nicht fort - shake im Ort! Why going so far to my gigs all the time? Villa Seilern has got a new managemant and I am happy to play some of my favourite bar-standards at the no 1 hotel of my hometown Bad Ischl - and I shake some boogie indeed. Cu @ home! Richie Loidl performing traditional american boogie music from the "shaky" heart of Austria. What a great honor for me! Richie Loidl Trio and the dancers of formation 88. 30,- reserved seat included (Formation 88 members 25,-). Reservation see above. Come, dance and shake with us! Richie Loidl & Clemens Vogler shake on two pianos at the Carpe Diem Bar! Have a very delicious dinner at the Capre Diem Restaurant before session. Please reserve tables in time! Richie Loidl & Clemens Vogler on two pianos, Robert Kainar on drums & Gernot Haslauer on bass, shakin at the 31st International AGA Congress. Shakin` for my friend Harald together with Anke Angel & band on two pianos. Save the date - details coming! Richie & friends of Union Boogie Club Gmunden! The authentic ship-session with excessive boogie dancing atmosphere! Traditionally I do the afternoon-warmup of the highlight-event at my brothers k.u.k. Hofbeisl. On that day the whole city of Bad Ischl is closed for cars - guests walk on a red carpet. Best open air sound guaranteed! At 18:00 be happy to shake, rattle and roll with my friend Mat Schuh & Band from Vienna! Watch out the k.u.k. Hofbeisl eventpage for more info! It is a great place in a court of a "cloitre". Richie Loidl, Anke Angel, Thibaut Chopin on bass, Stephane Roger on drums & two grand pianos. See fotos of 2011. Vive la France! 08.08.2014 | 18:00 | fri | open air festival: ONLY IF WEATHER IS FINE! Keep u up2date via website and facebook! 4th Brixen Boogie Festival: "Dine & Wine & Music"
Brixen is a very charming city in northern Italy, south of Innsbruck. Local top restaurants serve culinary highlights. Richie, Clemens, C. Steinbach, N. Rochelle & band shaking open air at the historic Domplatz. Free entrance! See Shake the Dome Movie and Shake the Dome pics to get an impression of the unique Event! Richie is powered and dressed by Luis Trenker, Bolzano. Richie Loidl, Clemens Vogler & band - two pianos, Robert Kainar on drums & Gernot Haslauer on bass. Carry-le-Rouet is a beautiful village between Marseille and Martiques and called "la Perle de la Côte Bleue". It was obvious to unify the blue sea & the blues, the beach & the boogie to create a unique summer experience of "SWING & FUN WITH SEA & SUN"! Richie Loidl & Jean-Pierre Bertrand unify their spirits of "Shake the Lake" & "Beaune Blues Boogie". Please like & share the CARRY FACEBOOK PAGE! This is not only a lake. It is the Lake Weissensee with its unique, charismatic atmosphere. There is something in the air. You can feel it. And there is Richie Loidl on piano and vocals, Franz Trattner on drums and Rocky Knauer on bass! Enjoy the most beautiful time of the year: Let`s shake the Wolfgangsee! Best cuisine and legendary bar as "Monte Carlo Platzl"! If weather is bad, we change date or shake inside at the Tex Mex in the Dorfstadl!. LIVE AT JOCKL`S WEINZELT AT THE "NÖRDLINGER MESS"
Joachim "Jokl" Kaiser is a great chef! I met him at the Intergastra and Internorga trade shows in Stuttgart and Hamburg. It was obvious that it will not take too long until we cook, shake and enjoy together. Don`t miss to visit him his famous Wirtshaus Meyer`s Keller in Nördlingen! At the "Nördlinger Mess" I`ll shake solo at his Weinzelt, located on "Kaiserwiese". Premiere of the "hall 7-session" during the "Salzburger Dult", the biggest public festival in western Austria with more than 130.000 expected visitors. R. Loidl, C. Vogler, M. Brandl & J. Schuetten shake with A. Angel, C. Steinbach, D. Ecklbauer, R. Shumy, H. Ahamer & H. Linecker, F. Trattner & G. Haslauer. Big Boogie Dancefloor! Entrance free! Reserve tables in time via contact above! Richie Loidl & Clemens Vogler on two pianos, Robert Kainar on drums, Gernot Haslauer on bass! Perfect ambience for a great night of enjoyment - outdoor garden session or indoor if weather is bad. We are from Austria, too! Richie Loidl Trio shakin at the bar after the famous "unplugged-concert" of Austria`s No 1 popstar & songwriter. Get your tickets in time! Richie Loidl Trio or band, planned also: Featuring "The Boogie Balloon"
It is the incredible and unique festival on the coolest event-ship on one of the biggest continental lakes of Europe! Shake the Ship Session on MS Sonnenkoenigin on sat may 3rd, 19h. Boogie Brunch at Wirtshaus am See on sun may 4th, 10h30. Please CALL OR EMAIL FOR TICKETS! Richie Loidl & Clemens Vogler "devoted to beauty". Find us at Alpenstrasse 119 - close to Hotel Schaffenrath. Richie Loidl Trio - Franz Trattner on drums, Gernot Haslauer on bass. Please reserve your table in time! Very cool packages with brunch or with room and entrance to saturday night boogie dance competition in St. Martin - 10 minutes from Schloss Muehldorf! Skiin`, and shakin` with sun & fun in Kitzbühel! As a student in the late 80ies I spent some of the best time of my life in Kitzbühel, working as a barman at the legendary Drop-In discotheque (now "Take Five"). Now I am back with Robert Kainar on drums & Gernot Haslauer on bass at today`s no1 and sunniest place with finest food, wine and best service! Great weather forecast! Get ready for that sunny sunday! The greatest boogie & swing dance festival in the world! Richie Loidl, Clemens Vogler & band feat. Nicolle Rochelle, Albert Koch & others shakin` for our friends Marcus Koch & Bärbl Kaufer. Reserve your tickets in time! Great authentic ambience! Meeting friends & partners and visiting new venues. Richie Loidl solo on the grand Boesendorfer Imperial, playing soft background grooves during cocktail and dinner hour at the balkony of the famous Ikarus restaurant. Traditional session with Richie, Clemens & band at one of the most charming wellnesshotels of the Austrian alps with certainly the most charming hotelières of the world. For delicious dinner before concert please reserve table in time! The session is powered by Trumer Pils. Richie Loidl & Daniel Ecklbauer on two pianos, Franz Trattner on drums, Peter Strutzenberger on bass. Tickets: 28,- with brunch included. Richie Loidl & Daniel Ecklbauer on two pianos, Franz Trattner on drums, Peter Strutzenberger on bass. Tickets: 12,- at the box office, 9,- advance sale, 7,- youth. Richie Loidl & Clemens Vogler on two pianos - "einfach leben" powered by Trumer Pils. This is not a hotel - it is a universe of wellbeing...! Richie & Clemens on two pianos, after dinner at the bar. Richie Loidl & Daniel Ecklbauer right beside the slope. Have a great lunch and shake with us in that unique atmosphere. The Dampfkessel is rewarded as "Beste Schihütte" / "Best Après Ski Bar" in Austria! Great two-nights-club-concert! Richie Loidl & Anke Angel, Christoph Steinbach & Nicolle Rochelle, Robert Shumy on 23rd, Clemens Vogler on 24th. Franz Trattner on drums, Gernot Haslauer on bass. See links above for details and ticket reservation! Richie and Anke Angel on two pianos in an intimate and tasteful atmosphere... The best way to start the new year! Richie Loidl & Clemens Vogler at Jean-Pierre Bertrand`s great festival. Perfect to spend an unforgettable weekend with us. Music, winetastings, restaurants, châteaux and sightseeing in one of the world`s best wine-regions. Richie Loidl solo for "Holter"
Richie Loidl feat. Andi Figerl. Please reserve tables in time to enjoy k.u.k. Hofwirt`s regional fine dinner! Richie Loidl, Anke Angel, Christoph Steinbach, Johnny Schütten, The Sazerac Swingers, Uli Twelker on drums, bass and two pianos. ...no better way to communicate "einfach leben" - the slogan of Austrias No 1 pils (=high quality lifestyle-beer). Richie & Co is shakin with Clemens or others on two upright-pianos during the whole tradeshow on the Trumer Pils-stand! We do this job for almost 30 years...!!! One of the best festivals in France! Since more than 15 years! On of the most beautiful villages of France! Family David's "Haras de Sens" is a pittoresque stud in one of the most beautiful villages of France / Normandy / 10 km off the coast near Cabourg. Raising horses (trotters) is David's principal business but also organizing a boogie-festival since 1996 twice a year. Therefore a stable was changed into a concert-hall. Perfect to spend an unforgettable weekend! 22.08.2013 | 18:00 | thu | If bad weather: Next day fri 23.08. 3rd Brixen Boogie Festival: "Dine & Wine & Music"
Brixen is a very charming city in northern Italy, south of Innsbruck. Local top restaurants serve culinary highlights. Richie & friends are shaking open air at the historic Domplatz. Let's spend an unforgettable time of enjoyment! Free entrance! See Shake the Dome pics 2012. Richie and Clemens are powered and dressed by Luis Trenker, Bolzano. All details on Shake the Dome Event-Website. Traditionally I do the afternoon-warmup of the highlight-event at my brothers k.u.k. Hofbeisl. On that day the whole city of Bad Ischl is closed for cars - guests walk on a red carpet. Best open air sound guaranteed! At 18:30 be happy to experience my friends Marty & His Rockin` Comets from Munich! Watch out the k.u.k. Hofbeisl eventpage for more info! ATTENTION: Only if weather is fine! Richie Loidl solo - thanks to Stoffi Steinbach! Location: Seebistro "SEE LA VIE"
D-79761 Tiengen | Festival in the city | free entrance! It is one of these typical german small and old villages with a picturesque inner city. 4 stages and 14 bands. Richie with Anke Angel, drums & bass. It is worth for a trip for the weekend! This is one of the very best events of the year. There is nothing else like this. This is unique. Richie Loidl solo on piano at Scalaria VIP area for brunches on saturday and sunday. Christoph "Stoffi" Steinbachs international invitational - celebrating his 10 years anniversary. Festival lasts from 11. until 13.7.2012. Because I have to leave for Scalaria Air Challenge on 13th I am shakin only on the 11th - maybe a little jamin' on the 12th. For details see Festival Website! Enjoy the most beautiful time of the year: "Shake the lakes" of the Salzkammergut - lets shake the Wolfgangsee! Best cuisine and legendary bar as "Monte Carlo Platzl"! Richie & Clemens Vogler on two pianos feat. drums and bass. If weather is bad, we shake inside at the new Dorstadl!. Richie Loidl & Clemens Vogler on two pianos. Schlumberger is one of our most traditional partners, whom we work with since a very long time! Take a taste of the new "DOM" at Schlumberger|s website! It is the most beautiful time of the year: White tops of mountains, light-green grasses and flowers. We are in the alps of the Salzburger Land. Winterstellgut`s Lisi Arzberger welcomes with endless charme and her chef offers a delicious brunch! Richie & friends & band. Please reserve as limited number of chairs & tables. If you love classic cars before the war, classic planes and rallye nostalgy you also love boogie woogie, indeed! Richie Loidl, Anke Angel and band live on stage. Please register at Classic Events website! 16th Boogie & Blues Festival: "The 4th Dimension"
Shaking is living - and life goes on! After 15 years anniversary and 2 years artistic break we are ready to shake! Please visit Shake the Lake website for details! Richie Loidl & Clemens Vogler on two pianos for Christian Wohlmuther, for whom we shaked 10 years ago! Last years it was the RC44 Americas Cup class competing at Austrias No1 sailing arena in the alps. Now it is the 12 meter carbon catamaran racing class! Richie playing at the VIP-ship between the races, feat. Don Bouchat. Limited places for visitors. Please contact PROFS Sailing for prices, info and reservation. See GC32 video channel. A unique experience! The incredible festival on the coolest event-ship on one of the biggest continental lakes of Europe! On stage: Richie Loidl & Clemens Vogler, Nicolle Rochelle, Anke Angel, Don Bouchat, Chrisoph Steinbach, Jean-Pierre Bertrand, Robert Shumy, Christoph Buhse, Gernot Haslauer! Big boogie dancefloor! Gourmet food & drinks! Three days packages with Bregenz Genussrallye and sunday boogie brunch! Richie Loidl & Clemens Vogler shakin for 150 chefs from all over Europe. Powered by Trumer Pils. Richie Loidl Trio shakin for the airport's business-partners, key account customers and friends. Someday we all fly away! public | CONFIRMED FOR EASTER SATURDAY! In the late 80ies I spent some of the best time of my life in Kitzbühel, working as a barman at the legendary Drop-In discotheque (now "Take Five"). Now I am back with drums & bass at today`s no1 and sunniest place with finest food, wine and best service! Great two-nights-club-concert! On stage: Richie Loidl & Clemens Vogler, Martin Schmitt, Christoph Steinbach & The Kittens, Robert Roth, Franz Trattner, Gernot Haslauer. Note: Kittens: 14.3., R. Roth: 15.3., all others both nights. See the fotos of 22.-24.3.2012! The concert is powered by piano.art - Piano & Music.Coaching . Richie Loidl Trio - Franz Trattner on drums, James Hornsby on bass. Please reserve your table in time! 25,- with brunch, 15,- without brunch. 83,- with room and entrance to boogie dance competition in St. Martin - 10 minutes from Schloss Muehldorf! See details. Richie Loidl Trio. See Autoflotte website for info. First sunday every month in skiing-season: Shake the Skis! Richie Loidl & Christoph "Stoffi" Steinbach right beside the slope on two pianos. The Dampfkessel is rewarded as "Beste Schihütte" / "Best Après Ski Bar" in Austria! Richie Loidl & friends right beside the slope. The Dampfkessel is rewarded as "Beste Schihütte" / "Best Après Ski Bar" in Austria! Richie Loidl & Anke Angel on two pianos, Robert Kainer on drums, Gernot Haslauer on bass. Richie Loidl trio right beside the slope. Go to the Maisalm Website for contact and location infos. This session is powered by my great partner Trumer Pils. Cheers! Richie Loidl & Clemens Vogler on two pianos. See congress-info on OEHV-Website. Richie Loidl & Daniel Ecklbauer on two pianos right beside the slope. The Dampfkessel is rewarded as "Beste Schihütte" / "Best Après Ski Bar" in Austria! Richie & friends on the mountains high. Richie Loidl Trio right beside the slope. The Dampfkessel is rewarded as "Beste Schihütte" / "Best Après Ski Bar" in Austria! Richie Loidl, Christoph "Stoffi" Steinbach on two pianos feat. Nicolle Rochelle and drums. Enjoy good dinner before concert - please reserve table! Albert Koch inviting his boogie & blues friends for a breathtakin session. 21.12.12 is the longest night of the year and the magic maya-date of the end of the world . Well - if it ends or not - we shake it anyway - and more than ever before ;-)! 20 Shake the Lake-Stars on 4 stages: 14h00: Eddy Miller Group; 17h00: A. Angel, N. Rochelle, J.P. Bertrand, S. Zingg, C. Steinbach, R. Shumy, D. Ecklbauer, A. Koch, F. Trattner, R. Mayer, T. Czihak, J. Hornsby and Clemens, Markus, Johnny & myself! See Shake the Shops-Flyer! Free entrance - save your money for shopping! ...no better way to communicate "einfach leben" - the slogan of Austrias No 1 pils (=high quality lifestyle-beer). As Clemens cannot come this year, Richie is shakin and swingin with & Anke Angel on two upright-pianos during the whole tradeshow on the Trumer Pils-stand! We do this job for more than 25 years...!!! I am looking for the roots of jazz and blues visiting all the famous life music venues, contacting local musicians, gospel-service in church on sunday, street parade, the zydeco and cajun-city of Lafayette, mississippi river boat etc ... Laissons les bons temps rouler! If you can make it there... How they do it I will see in a retail-marketing worksop and digging into the newest trends in fashion, music and style. Lets be inspired! I-00100 Rome | Exedra-Hotel | "Liege-Rom-Liege"
Richie Loidl shakin for a car race pricegiving-party. If you have got an oldtimer - go to the classic events-website, register, drive down to Rome and shake with us! "Triple R" stands for "Richie & Robert Roth". Robert is an upcoming local boogie pianist living in the Tyrol not far from Innsbruck. Entrance 20,- Euros, food is included! It is recommended to reserve your table! Great party with great people! Richie & Anke Angel with band on two pianos. The Salzkammergut Summer Sessions: "k.u.k. Boogie Piano Solo"
Traditionally I do the afternoon-warmup of the highlight-event at my brothers k.u.k. Hofbeisl. On that day the whole city of Bad Ischl is closed for cars - guests walk on a red carpet. Best open air sound guaranteed! At 18:30 be happy to experience my friend Eddy Miller Little Bigband from Munich - one of the best Swing-Shows of Europe! Click here for more info! "Shake the Lakes" 2012 - Vol. 3 (The Salzkammergut Summer Sessions): "Boogie at the Beach"
Enjoy the most beautiful time of the year: "Shake the lakes" of the Salzkammergut - lets shake the Traunsee! The Coconut-Bar is a real cool beach-bar with cool summerfeeling! Richie & friends on two pianos feat. drums and bass. ATTENTION: If weather is bad, date will change to the next day with shaky sunshine: Be informed by Coconut`s facebook and Upper Austria weather channel. Richie Loidl & Anke Angel on two pianos, feat. drums & bass. Details coming. 08.08.2012 | 18:00 | wed | If bad weather: Next day 09.08.! 2nd Brixen Boogie Festival: "Dine & Wine & Music"
Brixen is a very charming city right after the Italian border south of Innsbruck. 12 local top restaurants serve culinary highlights! Richie is shaking open air at the historic Domplatz feat. Anke Angel, Robert Shumy, Albert Koch, Robert Kainar on drums and Gernot Haslauer on bass. Lets spend an unforgettable time of enjoyment with us! Free entrance! See the Shake the Dome-Flyer for more info! Richie & Anke Angel together with J.P. Bertrand and others on july 19th. Festival lasts from wed 18th to sat 21st of july. Details and links via Jean-Pierre Bertrands Website! This is one of the very best events of the year. There is nothing else like this. This is unique. Richie Loidl solo on piano at Scalaria VIP area. Go to VIP area website for detailled VIP-program, go to public website for public program! Very great festival with Tom Jones, Sting & many other top-stars! Richie at boogie piano stage on wed 4.7. See Cognac Blues Passions Website for infos. Party all day long - starting at 10:00. Bigband Hall at 19:30. Richie & Band feat. Don Bouchat at 21:45. See Event-Web-Flyer! Free entrance! Enjoy the most beautiful time of the year: "Shake the lakes" of the Salzkammergut - lets shake the Wallersee! Strandbad Seekirchen with its Lakes-Bar is the best place next to the city of Salzburg! Richie & friends, two pianos, drums, bass. ATTENTION: If weather is bad, date will change to the next day with shaky sunshine: Be informed by Strandbad Seekirchen`s facebook and Salzburg weather channel. Richie & Clemens Vogler on two grand pianos, Jean Pierre Bertrand`s "Boogie System" sextet, Stoffi Steinbach, Nicolle Rochelle. It is the most beautiful time of the year: White tops of mountains, light-green grasses and flowers. We are in the alps of the Salzburger Land. Winterstellgut`s Lisi Arzberger welcomes with endless charme and her chef offers a delicious brunch! Richie & Clemens Vogler on two pianos with band. Please reserve as limited number of chairs & tables. I like to boogie - and I like to sail! RC 44 is a high-tech one-design class with downscaled Americas Cup-boats made in 100% carbon. Richie & friends shakin between the races on the VIP-liner. Please buy and reserve VIP-Ticket if you want to come on the boat. See the RC 44 Austria website for details. The cradle of the Shake the Lake festival are at the k.u.k. Hofbeisl. After 15 years - until it enters the "4th dimension" we do another special session Where it has it`s roots. Richie Loidl Trio on fri, 25th, Richie & the Lakeshakers with band and friends on sat, 26th. See details here! It`s one of the most upcoming metropole in the world with an intensive an pulsating lifestyle. Life is shaking - lets shake Shanghai! Richie Loidl, Clemens Vogler on two Feurich grand pianos feat. Franz Trattner on drums, Gernot Haslauer on bass. This special project is supported by our partner Trumer Pils (Trumer now distributed in China since 2 years) and by Feurich Pianos (local partner: "Hai Lun"). Richie Loidl Trio live on stage at 19:00 - DJ Rich from 23:00. Hope to cu - lets shake the Atter-Lake ! Entrance 25,- - free food and drinks! Richie Loidl shakin solo for the no 1 shredding company at the world's leading trade fair for water, sewage, waste and raw materials management. Richie Loidl & Clemens Vogler on two pianos. Solo or duo piano performance. Not sure if I can play personally. Details coming. "Inspire your business" is the slogan of the "Event" magazine, inviting key account partners to this exclusive night. Richie Loidl, Clemens Vogler & band on two pianos, feat. "the boogieballoon". Richie Loidl, Clemens Vogler & band at the company's sales meeting. Great location to shake! The incredible festival on the coolest event-ship cruising on one of the biggest continental lakes of Europe! See the great movie of Shake the Ship 2011! Richie Loidl & friends right beside the slope. Together with guest-star Christoph "Stoffi" Steinbach on two pianos - the man who plays faster than his shadow! On drums: Franz Trattner! The Dampfkessel is rewarded as "Beste Schihütte" / "Best Après Ski Bar" in Austria! Richie Loidl & friends right beside the slope. Together in trio with Franz Trattner on drums and Gernot Haslauer on bass! The Dampfkessel is rewarded as "Beste Schihütte" / "Best Après Ski Bar" in Austria! Richie Loidl solo on piano. See congress-info on OEHV-Website. Richie Loidl & friends right beside the slope. Together with Clemens Vogler - we are the classical incredible Dampfkessel piano duo. Robert Kainar on drums! The Dampfkessel is rewarded as "Beste Schihütte" / "Best Après Ski Bar" in Austria! It's one of the best culinary addresses in Munich! Richie and Anke Angel on two pianos in an intimate and tasteful atmosphere... The best way to start the new year! Reservation obligatory! See the tasty new years menu and music info. Christmas is over - New year is close. To enjoy these days in a place like the Posthotel is a privillege. If you don't know this giant "tyrolean temple of wellness" take the chance an pass by at the bar after dinner and shake with Richie & Anke Angel on two pianos, Franz Trattner on drums, Gernot Haslauer on bass. After great success in 2009 and 2010 we shake the shops like never before: Lakeshakers Richie, Clemens & Markus feat. Anke Angel, Silvan Zingg, J.P. Bertrand, Nicolle Rochelle, Chr. Steinbach, Daniel Ecklbauer, Albert Koch, 2 x drums & bass, 4 stages! ...no better way to communicate "einfach leben" - the slogan of Austrias No 1 pils (=high quality lifestyle-beer). Richie & Clemens on two upright-pianos shakin and swingin during the whole tradeshow on the Trumer Pils-stand! We do this job for almost 25 years...!!! One of the best festivals in France! 15 years anniversary edition! The most beautiful village of France! "Einfach genießen - einfach golfen"
Why going so far for my gigs all the time? The new hotel Villa Seilern in Bad Ischl has got a nice bar with a grand piano and barman Augusto serving best italian wines & cocktals. I play my favourite bar-standards - and I shake some boogie indeed ;-) After-show we'll have a drink at my brother's k.u.k. Hofbeisl 2 minutes away. Cu @ home!